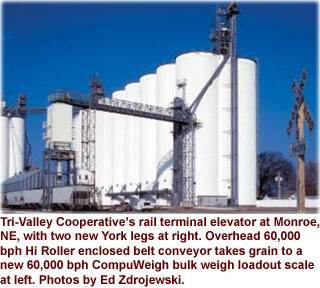 Like many farmer-owned cooperatives across the High Plains, St. Edward, Nebraska based Tri-Valley Cooperative has sought the grain merchandising advantages that come with the ability to load shuttle trains. To that end, in 2002, the cooperative added enough trackage at its Monroe, NE elevator (402-495-4645) to boost its railcar capacity from 75 to 100, in order to ship on the Union Pacific (UP). The UP requires shippers to load trains in 15 hours or less, so it was necessary to upgrade the facility’s load out capabilities, says Location Manager Dave Wagner. 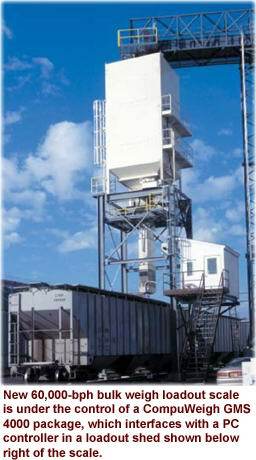 Along with a 60,000-bph CompuWeigh bulk weigh load out scale trackside, the project, which was nearly complete at the end of February 2003, included two legs, three conveyors, a scalper, and new actuator gates connected to five concrete storage tanks at the 800,000-bushel elevator. Contractor and millwright on the project was Nebraska Grain Systems Inc., York, NE (800-788-4658). Marley’s Electric, Columbus, NE (402-564-8614), wired the electrical systems. Construction began in the fall of 2002. 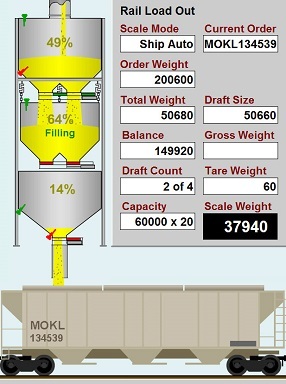 The entire load out system is fully automated and controlled from the load out workstation running CompuWeigh’s Grain Management System (GMS). The GMS package includes CompuWeigh’s CD-4000 to control the 60,000-bph bulk weigh scale and automation for controlling all the components from the actuator gates on the storage tanks to the cross conveyor, legs, and scale. The new SmartGate actuators are used for the five automated gates feeding the 30,000-bph side-draw Hi Roller enclosed belt conveyor and the five automated gates feeding the 15,000 bph Hi Roller enclosed belt conveyor in the tunnel. The system controls the percentage each gate is open with an accuracy of 1% and allows the operator to control the gates for each group with common controls. This allows the operator to easily make “on-the-go” blending changes. The new SmartWatch digital hazard monitoring system examines the data from bearing temperature, alignment and speed sensors on all the belt conveyors and legs in the load out process. The system uses both limit and differential temperature monitoring routines to alert the operator of any problems. SmartWatch directly integrates to the PLC/HMI automation system and displays the temperatures, speeds and any alarms on the load out workstation. The SmartTech Opto box provides the interface between the CD-4000 controller and the bulk weigh scale. Continuous scale diagnostics built into the controller ensure proper operation of the scale. It informs the operator of any problem and then shows on the screen what the problem is, where it’s located and how to fix it. the operation of 10 actuator gates for continuous blending during load out. aspect of load out operations. The SmartRead system automatically identifies the railcars to be loaded via RF tags mounted on each car, eliminating the need to ‘walk the track’. As the cars are scanned, the car ID is sent to the GMS-4000, where the car is found in the SmartCar database. The optimum load limit is calculated based on weight, volume of the car and any track limitations.